When you first start driving an electric car, one of the biggest adjustments you have to make is with the heating. 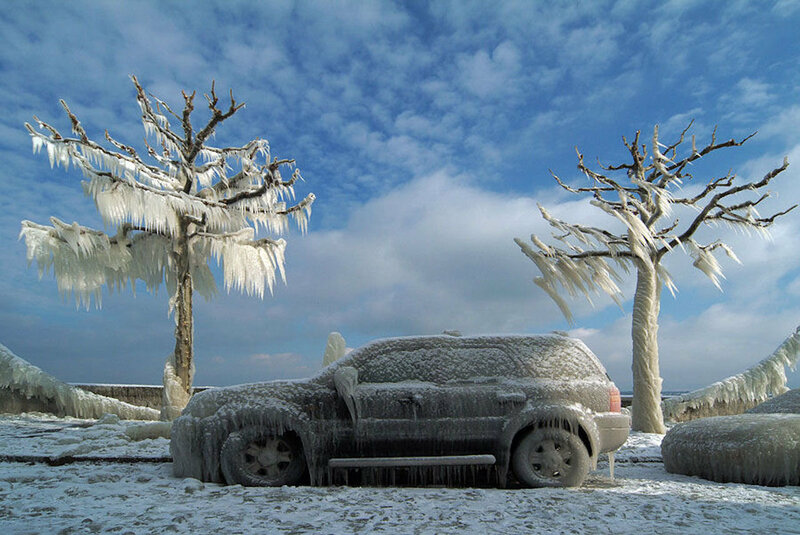 While it’s an equal pain to scrape ice from any kind of car, once a combustion engine is running it soon warms up. Electric cars, by contrast, won’t warm up at all unless you switch on a heater, which immediately begins to rob the battery of range. So the electric car driver may sometimes have to make an unpleasant decision between keeping warm and getting safely to their destination. Electric car manufacturers are tackling this dilemma in multiple ways, but it’s worth stopping to consider why they need to. Conventional cars with combustion engines are not especially good at turning fuel into motion. Even in a modern car, as much as two thirds of the energy from the fuel is lost as waste heat. Most heat exits through the exhaust pipe, and the rest goes via the car’s radiator, without which the engine would overheat. A small proportion of this byproduct heat is sufficient to keep the cabin toasty – there’s a second, smaller radiator built into the dashboard, plumbed into the engine’s coolant, that provides plenty of heat on demand. Electric motors, by contrast, are highly efficient and produce very little heat – not nearly enough to rely on in cold weather. So electric cars have to get warm in another way. The simplest option is to fit a fan-style heater into the dashboard. Just like a hairdryer, air is blown across wires kept hot by electricity. The snag is that this style of heating saps lots of energy from the battery, reducing the amount available for driving. In a Nissan Leaf, for example, the range can drop by a third if you keep the fan heater on full blast. To reduce this problem, many electric car makers provide preconditioning – the ability to heat (or in summer cool) the cabin while it’s still charging from the mains. You set preheating using a timer, or even control it via a smartphone, letting you arrive to a warm car with a full battery. You’ll still need to spend battery reserves staying warm on your journey, but at least you’ll get off to a good start. Renault, meanwhile, has come up with a way to eke more heat out of the battery’s power, by giving its Zoe ZE electric car a heater that can blow three times as much energy into the cabin as it takes from the battery. That means the car might lose only about an eighth or a tenth of its range to heating, rather than a third. It sounds impossible to give more energy than you take from the battery, but Renault hasn’t broken any laws of physics. The French firm has simply employed a machine called a heat pump, which uses a small amount of energy to carry warmth from one place to another. You might not know it, but you have an electric heat pump in your home. Household refrigerators work by pumping heat from their insides out into the kitchen – that’s why they have arrays of black metal fins at the back, to radiate away the warmth they’ve taken from your milk, eggs and cheese. Just like a fridge, a heat pump can keep moving warmth from a place that already feels warm to another place that already feels cold. So even if it’s a chilly day, Renault’s Zoe can still borrow some of the energy from the air outside to warm up its cabin. In effect, Renault’s heater warms the car by trying to refrigerate the outside world. And because it’s pumping warmth from one place to another, rather than making heat from scratch, it needs much less energy from the battery. The drawback with heat pumps is that they are relatively complex and costly compared to a hairdryer-style heater. But fortunately, if your electric car has air-conditioning, the expensive bits and pieces are already there. An air-conditioner and a heat pump are essentially the same thing, they just move heat in opposite directions. In the future, high-power chargers and bigger batteries may sweep away any worries about keeping an electric car warm. But for now, engineers will continue to work on better ways to keep your toes warm while still getting you all the way to your destination.